In the latest trailer for Resident Evil 6 a woman who looks like Ada Wong refers to the new character as “Wesker Jr.” Capcom have said that the new character is called Jake Muller and the he is indeed Weskers son. Jake is a gun for hire, and will be joined by a character some of you may recognize from Resident Evil 2, Sherry Birkin. Zombies are making a return, and will now be capable of running, jumping and even using weapons. The J’avo creatures, which were previously unveiled, will be able to regenerate when injured, more interestingly however they will also have the ability to mutate damaged body parts into various other forms, forcing the player to take new tactics to continue the fight. The game will feature both Co-op and Versus multiplayer modes, and it will be supported by both online and local play and will also feature a Mercenaries mode as well. Capcom are choosing not to confirm how many players the game will support, but the press releases only mentions 1-2 player support. Capcom will likely announce the final details at a later date. 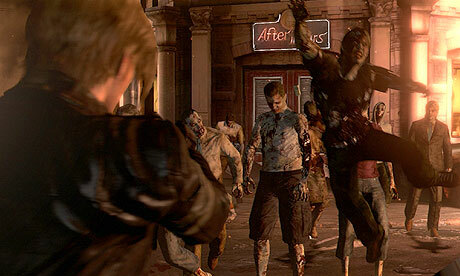 RE6 Zombies can now run, jump and even use weapons! The game will also come with support for multiple languages. Complete with localized voiceovers in English, French, Italian, German and Spanish, and also features subtitles in Japanese, Russian, Polish, Portuguese and Brazillian. Resident Evil 6 is due to release on October 2nd 2012 for Xbox 360 and Playstation 3. The game is also planned to release on PC, but a date has not been set yet.